Some fine wine glasses always attract me as I am the one who is closely in love with expensive and delicate crockery items. A wine glass named after wine is extensively used worldwide and due to its certain name, it is given a certain shape as well having three major parts bowl, stem and foot. 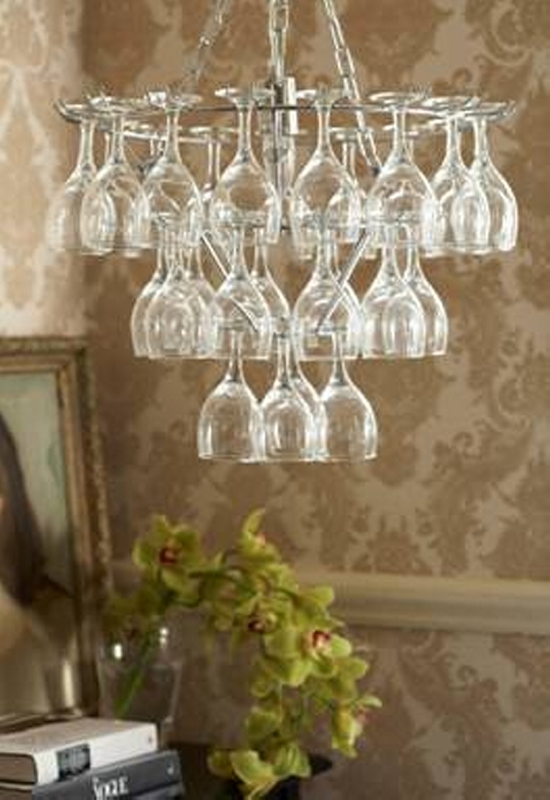 Pardon me, I am going to do a crazy thing with these exquisite wine glasses, I am going to recycle them as chandeliers. 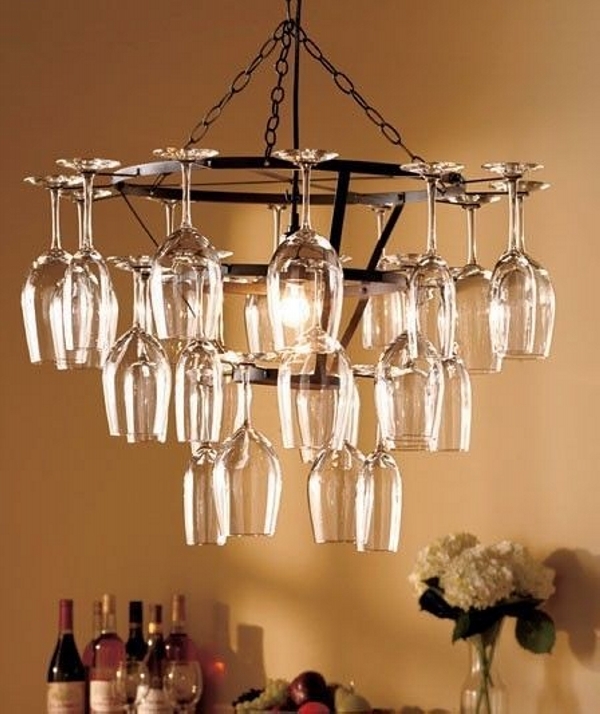 But I think making a classic chandelier would give you enough relief and you would be ready to sacrifice your newly bought wine glass set. 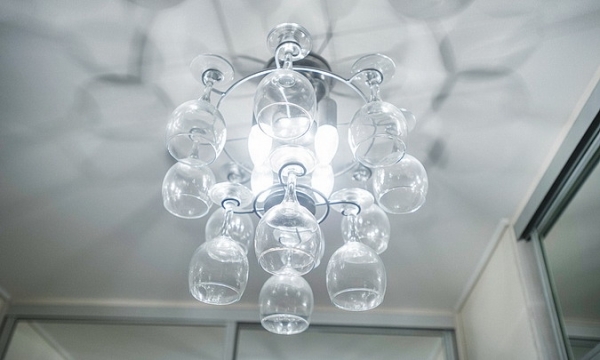 Before we get started, you must bear one thing in mind that these wine glass recycled chandeliers aren’t going to be that simple, you have to make some arrangements where you might need the help of some professionals. Because making the metallic frame isn’t at all that easy task. If anyone of you isn’t ready to spare his or her newly bought wine glasses, he can also go for these disposable beer glass bottles and install or use them on the place of wine glasses. Just the way we did here in this project. 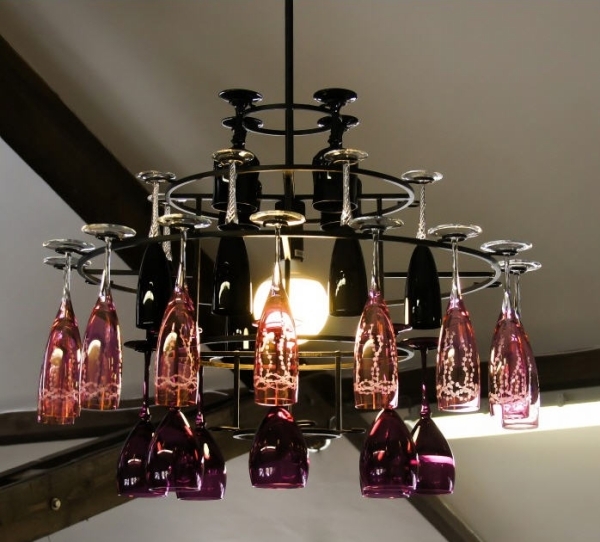 This is a classic wine glass recycled chandelier installed inside a lavish house. Having a detailed look we realize that a very robust and strong metallic frame is prepared some fine wrought iron pipes, and in the design some inward twisted hooks are spared for each wine glass. And they are fixed respectively. 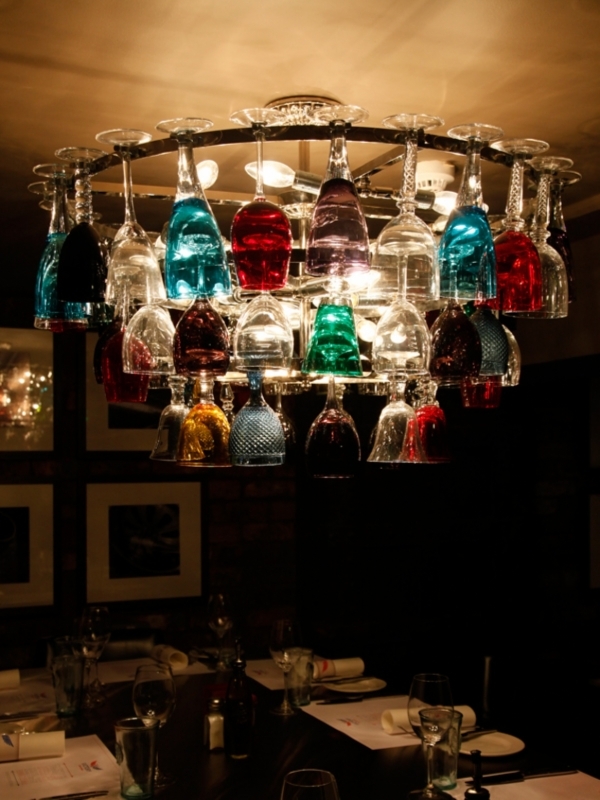 This one would be more than sufficient for a large hall, as it has got a large number of bulbs embedded in transparent wine glasses. Chained up with some heavy duty chains, the base of the chandelier is made using some robust metallic slabs so that weight is sustained effectively. 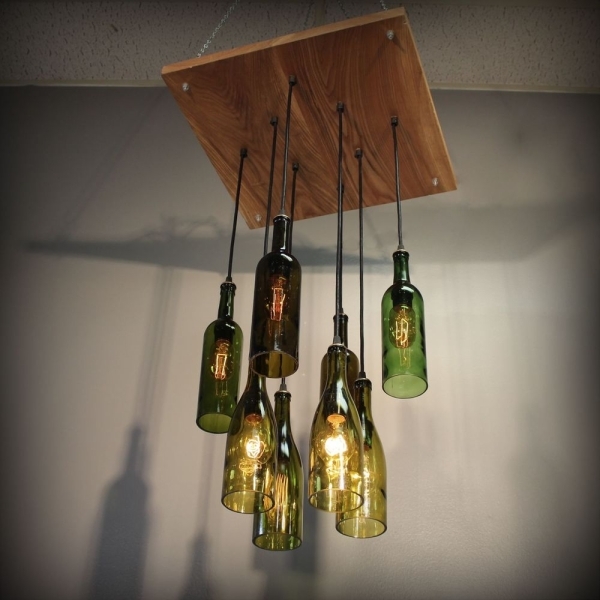 Well, this one could be called a bit simple one as the frame consist of a mere round metallic wire with round provisions for hanging the wine glasses connected to heavy duty steel chains ensuring the strength of the chandelier. 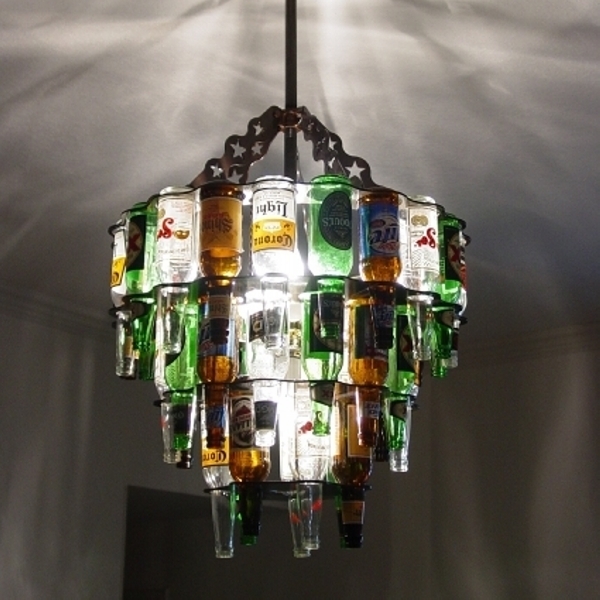 But the exquisite wine glass recycled chandelier has got simply no match. How about this one? This is simply outstanding. 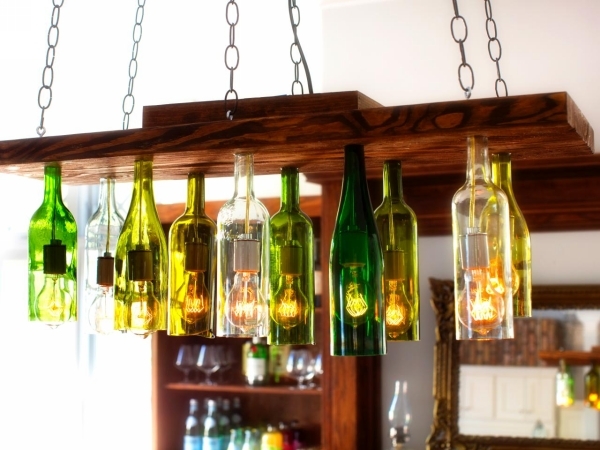 Thick robust wooden slab attached to metallic chains connecting to roof, and some glass bottles crossed along the wooden slab are used all around, the bottom of the bottles was simply removed to cross the Edison bulbs. This is worth giving a try. These wine glasses are a bit different in the appearance. 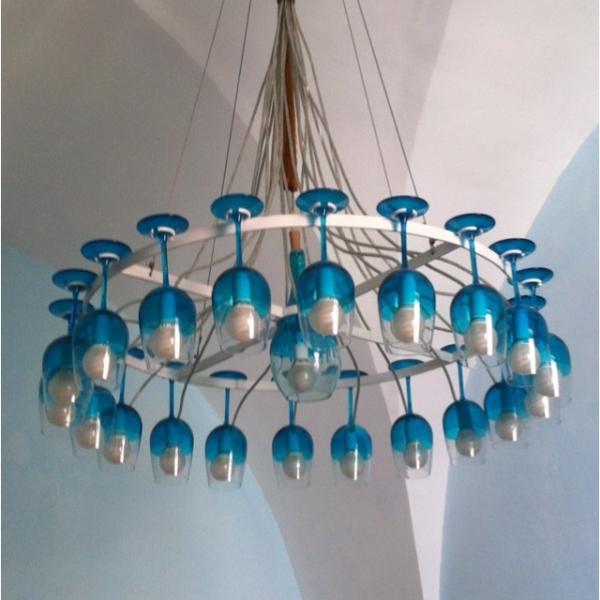 Their bowl and foot is painted with light blue color which is a beautiful feature of this wine glass range. 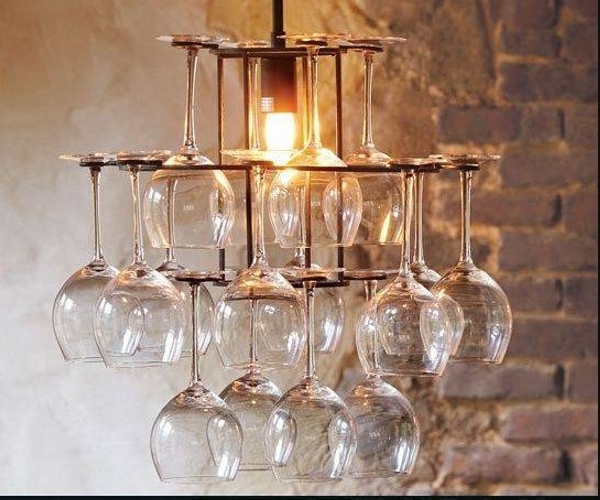 Using these wine glasses in recycling a lighting chandelier would be pretty by default due to this beautiful paint of wine glasses. The final one is probably the best of all. But you would have to go a bit far in the pursuance of this beauty. 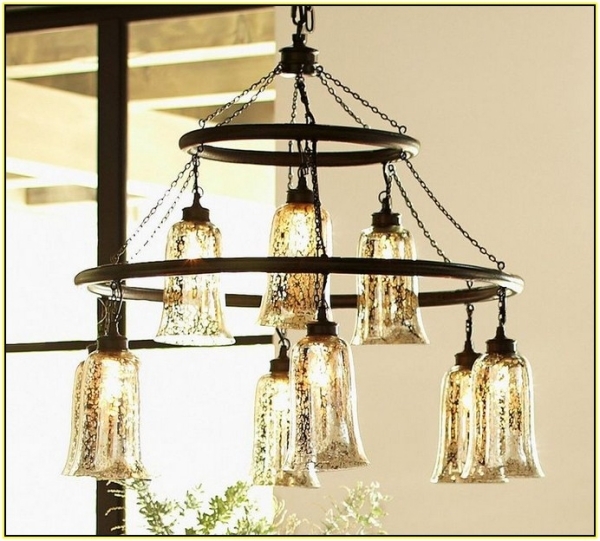 Some proper glass flasks are used here that are appropriately used in such lighting installations, round wrought iron pipes are used in the frame, and a touch of chains is there to further enhance the beauty.